Want to know a secret? When I planned to make this dish there was a small part of me that imagined this might end up in the trash, uneaten. Earlier in the week when I visited the farmers market the fennel bulbs looked so crisp and fresh that I couldn’t resist picking up two bulbs. A vegetable that I didn’t grow to love until I learned to roast it a few years ago, two bulbs was a bit optimistic for one week of cooking when my fennel repertoire is still limited at best. But you can never go wrong roasting it and I ate it raw in salads on our recent trip to France. I brought home the two bulbs inspired for a fennel-filled week. For breakfast and lunch I had toast or sandwiches using my favorite seeded sourdough baguette with fennel, poppy and sesame seeds. I baked these Cheddar and Fennel Seed crackers and I was so happy with them that each time I passed by the kitchen counter I walked away with one in my mouth. But there was still the question of what I would do with the fennel bulbs save for roasting them. Then I was inspired to pair the fennel with the sweet chicken sausage I also purchased earlier in the week. With fennel seed in the sausages I wondered if the fresh fennel would be a good pairing…or if it would be too much of a good thing. In my experience though, the licorice flavor of fennel mellows during cooking so I pushed on even with mild reservations about not only my husband rejecting dinner but me, too. …we LOVED this dish! See how colorful it is in the bowl? Imagine an equivalent amount of flavor but don’t think you’re eating a bowl of licorice. The sautéed fennel mellowed out as I’d hoped so it enhanced rather than overpowered the tomatoes and basil. If you’re not a big fan of fennel please don’t be afraid of this dish; remember, I wasn’t always one myself. This jumped to the “favorites” category after the first taste and it was just as good, if not better, the next day. Can you tell I’m enthusiastic about this dish? Chalk it up to my surprise that it didn’t end up rejected. I’m glad I went with inspiration and now I have a new pasta dish to add to my weeknight rotation. This simple dish is at its most flavorful in summer when in-season tomatoes lend a lot of natural sweetness. 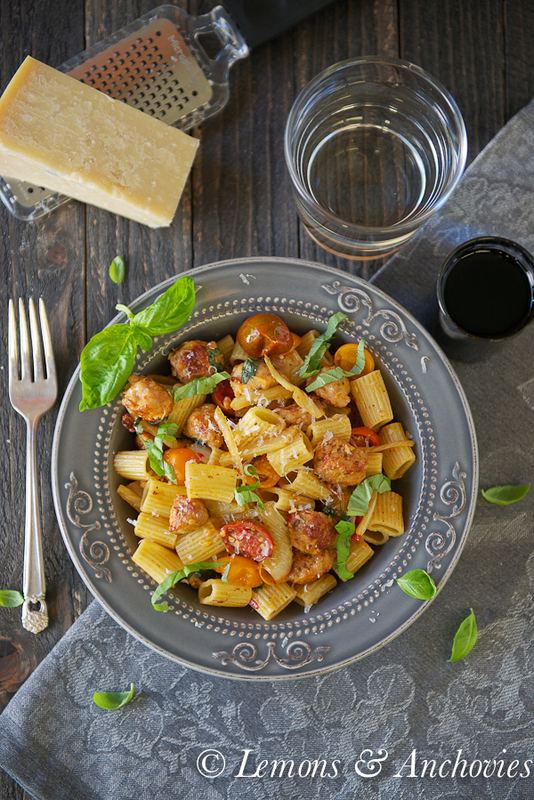 Off season, you can amp up the flavor by adding more basil or parmigiano reggiano (or you can lightly oven-roast the cherry tomatoes first in order to bring out their sweetness). Cook pasta in salted boiling water until al dente. Drain, reserving some of the pasta water and set aside. Meanwhile, heat a few tablespoons of the olive oil in a sauté pan large enough to hold the pasta over medium to medium-high heat. Add the small pieces of sausage and cook for 5-6 minutes. Transfer to a bowl including any browned bits in the pan and set aside. You can drain some of the rendered fat from the sausage but I didn't do that. Reduce the heat in the pan to medium and add the sliced fennel and chili sauce (or chili flakes). Cook for 3-4 minutes until they're crisp-tender and their flavor has mellowed (season to taste). You can add more of the olive oil if you like. Pour in the rosé, turn up the heat to medium-high and deglaze the pan. Add the tomatoes and cook for 2-3 minutes then add back the cooked sausage, including all the brown bits. If the mixture looks dry--remember you'll also be adding the pasta--add the rest of the olive oil. Throw in the cooked pasta (I ended up using a little over ⅔ lb) and basil chiffonade and stir everything together. Season again with salt and pepper if you like. You can add more olive oil and/or some of the pasta water (a tablespoon or two at a time) for more moisture. Plate and generously sprinkle with freshly grated Parmigiano-Reggiano. I LOVE fennel- and I agree, it’s even better roasted. This would be a perfect weeknight dinner dish. This soup is unique and perfect for alleviating early autumn blues. LOL, Valerie! No more fennel recipes on the horizon for a while (I think!). I completely agree, roasted fennel is the way to go and I do like fennel sausage. Gorgeous pasta dish! I just love visiting your space, so bright and cheery. This dish with roasted fennel, the liquorish taste is lovely. A great weeknight dish. Jean – I love fennel – both raw and roasted! 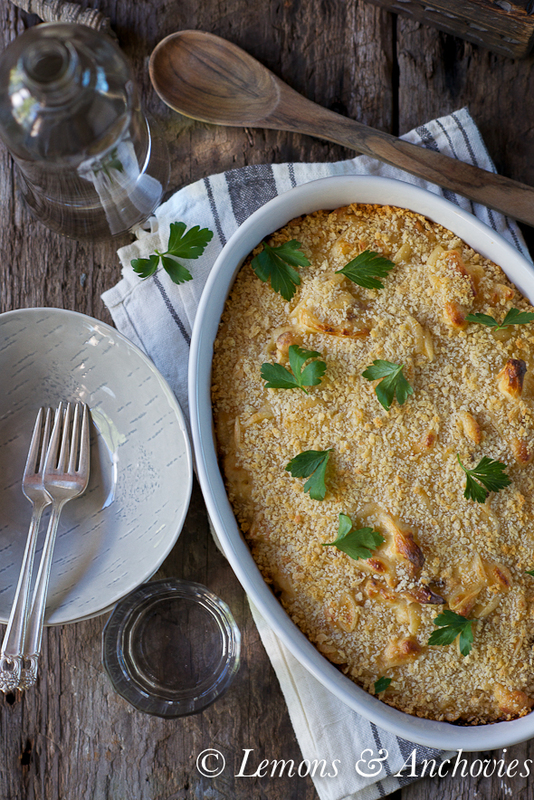 I actually had it up at Redd Wood in Yountville a few weeks ago in the form of a Fennel Gratin – delish! 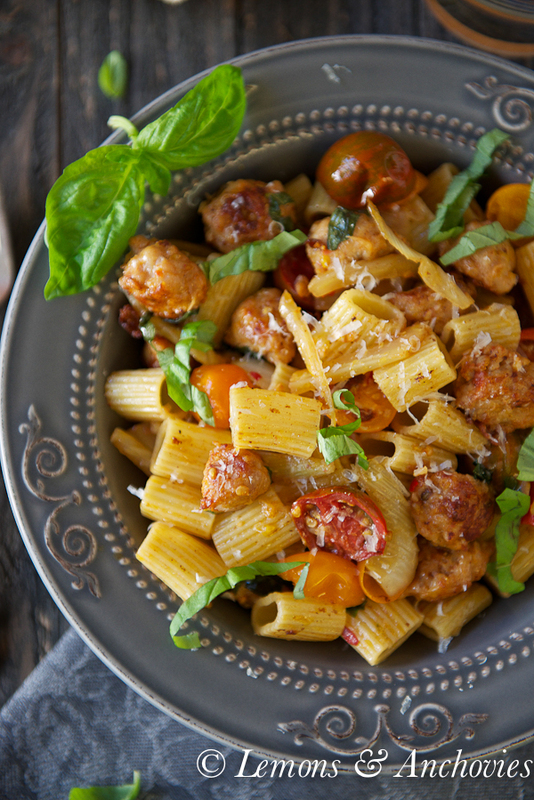 Speaking of delish – your pasta dish is right up my alley. Perfect for a fall night. Happy Saturday! This is my favorite kind of pasta dish. I love being able to try different flavor combinations without the pasta drowning in sauce. Another great way to enjoy fennel is braised in a little bit of vegetable (or chicken) broth. Just cut a peeled fennel bulb into quarter, then saute it in a small amount of olive oil until it is golden around the edges. Add enough broth to come up to about halfway up the sides of the fennel and bring it to a simmer. Simmer, covered, until tender. Mellows out the flavor and makes it sooooooo good! This dish has my name written all over it. I love fennel, sausage and pasta together. I just watered by basil plants in my deck planters and was wondering what inspiration would come to me for their use. This is perfect. I am so in awe of your recipes and photography Jean. Loved following your beautiful days in the French Riviera! Welcome home 🙂 I’m not a huge fan of fennel but I’ve wanted to find a dish that I think hubs would like so I could incorporate it somehow, and now I have! I am always unsure with what to do with bulbs of fennel, so I never end up buying them. 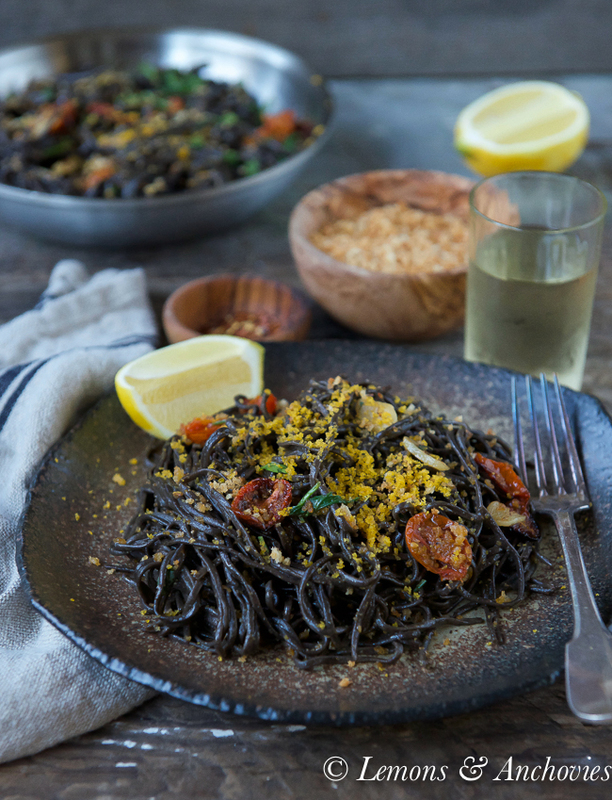 Love this pasta, it sounds wonderful – now I have a reason to buy them! You’ve inspired me to try fennel, I haven’t ever used it in my recipes the only type I’ve had is the dried fennel seeds. Your pasta looks gorgeous I want a bowl and want to dig right in. I love fennel. I wonder if the fennel you find there has a stronger flavor than ours here. The flavor of fennel here is so weak compared to what we have when we’re in Italy. I do love fresh fennel in salads and I bet the flavor in this pasta was incredible. A really nice end of summer pasta w/the pretty tomatoes or beginning of fall comfort dish, Jean. Try Giadas Chicken Milanese. It has a fennel and marscapone sauce that will blow your mind. What a vibrant, delicious-looking salad, Jean! 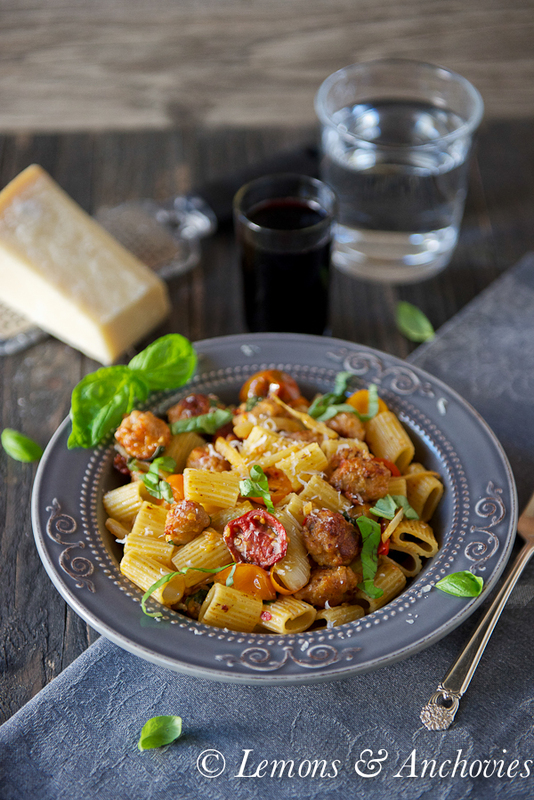 I’m waiting for my dinner, in the oven now, and this pasta is really looking very good to me -I think I’m going to make this one Jean-that close up of the pasta in the bowl is just gorgeous! I like the addition of rosé for the deglaze. What did you use? Made this week and was delicious!